Motivational Words by Mahatma Gandhi. Many people thinking that "Are they used to inspire and in turn cause action? 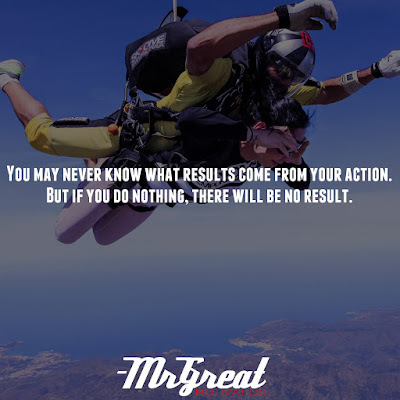 What are the results when an action occurs?" One thing we are exploring at work is the importance of action/taking action in learning.Learning that is more important and meaningful not only because there is a search for results and outcomes. But also that the learning arising from taking action, taking part in a process of taking action and the results that arise, whatever they may be… In doing so we are creating powerful partnerships on many levels. We all know what we are doing is nothing more than a drop in the ocean. But if the drop were not there, the ocean would be missing something. So sometimes if we feel that our actions don’t come out with any outcomes, do not worry about results. It will come and may be visible later on. Motivate your life with action. Don't wait for it to occur. Make it befall. Secure your own destiny. Make your own fortune and whatever your beliefs, honor your creator, not by passively waiting for grace to come down from upon high, but by doing what you can to make grace happen...Yourself, right now, right down here on Earth. Your words become your behaviors, Your behaviors become your habits, Your habits become your values, Your values become your destiny.